In her one-day trip to Moscow, Timoshenko’s biggest objective is to renegotiate the terms of Ukraine’s contract with Gazprom, the state-owned energy provider. “We shall discuss the reduction of natural gas consumption by Ukraine,” Timoshenko told reporters on Monday in the city of Kagarlyk, Kiev Region, where she attended a ceremony dedicated to handing over keys to new apartments for the thousands of people who were forced to leave their homes following the Chernobyl nuclear disaster [On April 26, 1986, the nuclear reactor at Chernobyl exploded, killing 56 people, and forcing the resettlement of some 360,000 residents]. The Ukrainian prime minister, famed for her wraparound blonde braid and role in the country’s Orange Revolution of 2006, seems upbeat about her meeting with Putin. “I am sure plans of gas consumption will be corrected. It will be a conversation on the level of two prime ministers,” she said. In January, Yulia Timoshenko was in Moscow where she and Prime Minister Vladimir Putin settled a gas row by hammering out a 10-year gas agreement for imports to Ukraine, as well as to Russia’s European clients, which rely on Ukraine as a transit route. Presently, Ukraine is importing about half of the contracted gas volume from Russia since the start of the year, while Gazprom is demanding that Kiev be penalized for reneging on the terms of the contract, which runs until 2019. Under the contract, which brought to an end a dispute that interrupted Europe-bound supplies, Naftogaz, which is now under obligation to buy 40 billion cubic meters of Russian gas in 2009, is entitled to request an import reduction of 20 percent. However, the contract states that such a request must occur six months before the next contract year. Naftogaz says that it only needs 33 billion cubic meters of gas to cover demand in 2009, but will Gazprom be willing to make amendments to a deal that was signed just three months ago? Mikhail Krutikhin, a partner and analyst with RUS Energy, thinks that Gazprom, which itself is being forced to reduce its own purchases from Central Asia, may be willing to cut Ukraine a break. “This situation is rather interesting because Ukraine is suffering from the same problem as Gazprom is suffering in its relations with Turkmenistan,” Krutikhin said in comments to RT. Krutikhin believes that the authorities in Turkmenistan, which are upset with Gazprom’s cutback in purchases, may be swayed to see the situation in a new light given Moscow’s example. 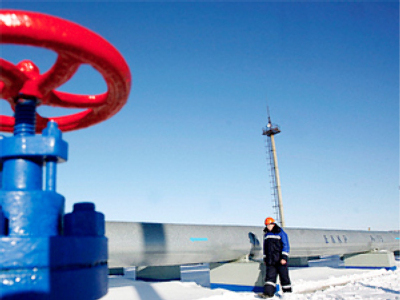 “It [Gazprom] cannot take as much gas as it contracted because of the diminished demand,” Krutikhin said. “And maybe Gazprom will help Ukraine just to give a good example to Turkmenistan,” he said. Finally, in a possible deal sweetener, as well as a guarantee of the “stability” of future gas supplies – something that the rest of Europe is forever fretting over – Timoshenko also said that Ukraine would be looking to buy 19.6 billion cubic meters of Russian gas this year to send into its underground storage facilities. Eighty percent of Russia’s gas exports to Europe pass through Ukraine, and no other reliable route will be available for many years. But Timoshenko, who is trying to carve out a political niche separately from President Viktor Yushchenko, who is suffering miserably in the polls, has a host of other issues on her mind besides gas. The Ukrainian prime minister, with a possible eye on the upcoming presidential elections in October, knows what going home with a successful stimulus package from Moscow could mean in the polls. “I will pay the visit to sign this agreement,” said Timoshenko, in regards to the possibility of a joint aircraft building contract between Russia and Ukraine. The prime minister also alluded to Russia and Ukraine’s history of intellectual partnership. On another economic front, Timoshenko discussed the possibility of increasing the partnership between the two countries in the machine-building sector, due to Ukraine’s inability to maintain “full-scale operations” during the crisis.